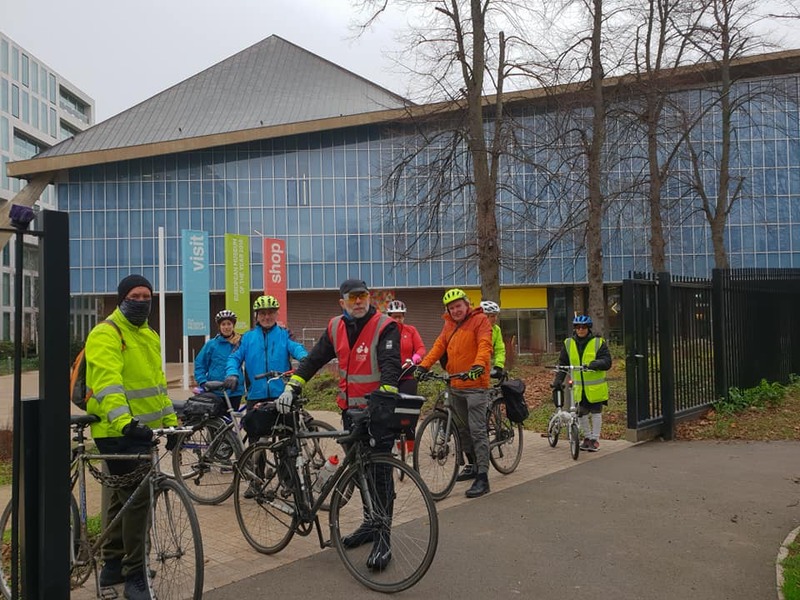 The 52nd Saturday of the year and 12 riders met in unseasonally mild weather at Canada Water for Southwark Cyclists's 52nd healthy ride of the year. 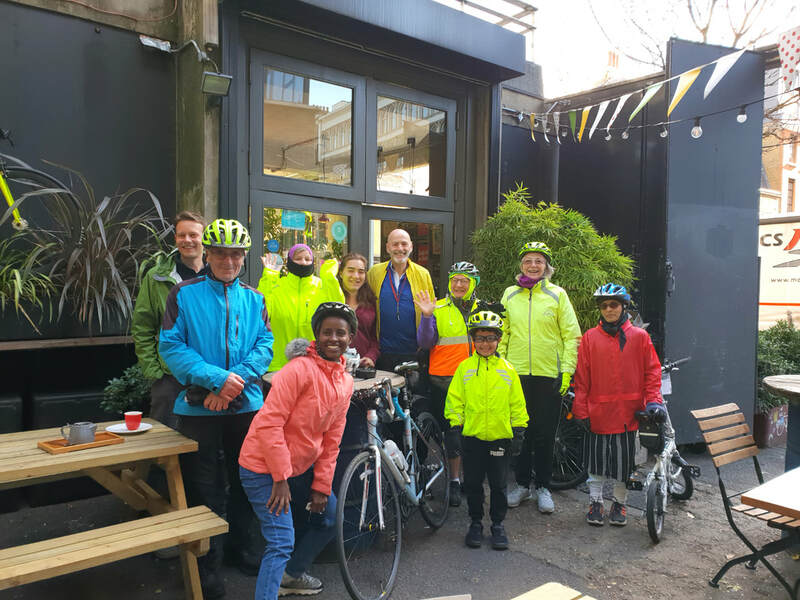 On two rides earlier in the season (London Fields in June and Notting Hill in December) we had stumbled across Quietway 2 and as both had some good bits a ride to the British Library was sufficient reason to explore more of it. 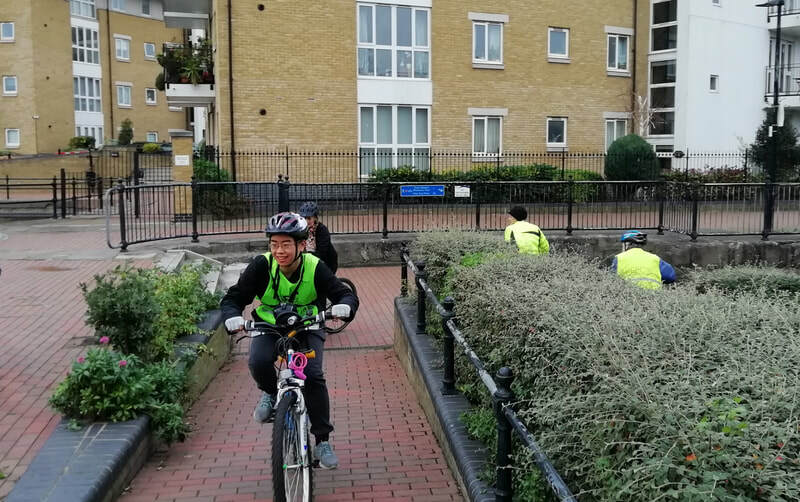 We followed June's route (NCR4, Q14, CS7, Q11, Q13 and the best part of CS1) to Pitfield St, where we turned left into Q2. Most of us were not familiar with this part of Hackney and we enjoyed the glimpse of De Beauvoir Town before crossing into gentrified Islington. London was very quiet on the Saturday after Christmas. Permeable bollards and other road closures made it safer to look closely at the scenery. St John the Evangelist (i.e. his church) came as a surprise, a lot of red bricks standing out from its London stock neighbours, with the spires sticking out asymmetrically. Then a chance to see the Regent's Canal before it disappears in the tunnel at the Angel. Q2 them crossed City Road, Goswell Road and St John Street safely. Another impressively sized church, St Mark's in Myddelton Square, indicated that we had reached Clerkenwell and were close to the sink of the New River. On the other side of Farringdon Road we left Q2 and picked up a recent stretch of CS6 but it can't be used (yet) to cross Euston Road so detoured slightly. 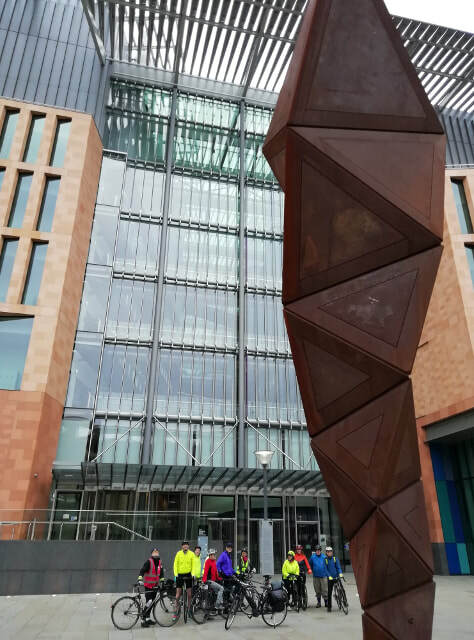 That gave us a chance for a stop outside the impressive Crick Institute, London's important new biomedical research centre. The location next to St Pancras International is significant, many of its researchers (still) come from EU27 countries. Refreshed we started our ride back. Q1 is familiar to Southwark Cyclists but not everybody knew that it has an extension north of the river. This took us from Bloomsbury around the British Museum and behind Covent Garden to Waterloo Bridge (not always that quiet) and down to the South Bank. We departed from Q1 after Tower Bridge Road and went through Southwark Park to get back to Canada Water. Quietways and quiet roads and kind traffic lights meant made good time on the return leg and we finished 2018 ten minutes early. Dec 26th, 10-12. Boxing Day Ride - Sculptures in the City. Dec 22nd, 2018. 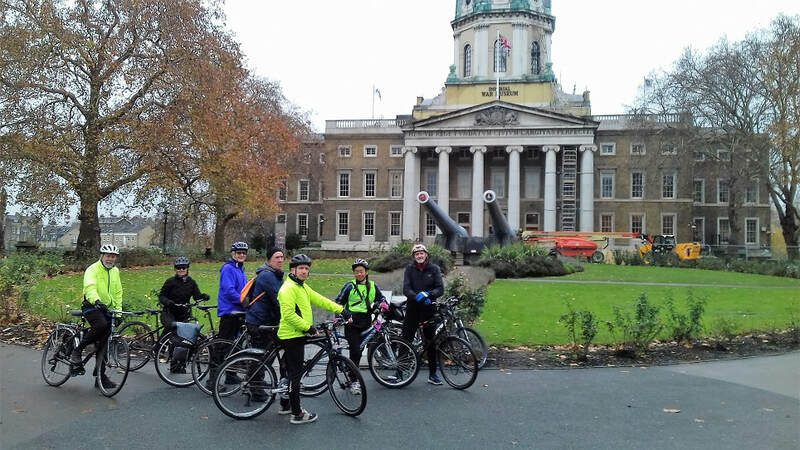 Survivors from Dec 15th ride remarked on the balmy weather - relatively speaking. A dry day, still cold, but average for December. 20 riders set off from Peckham Square with Amanda leading. 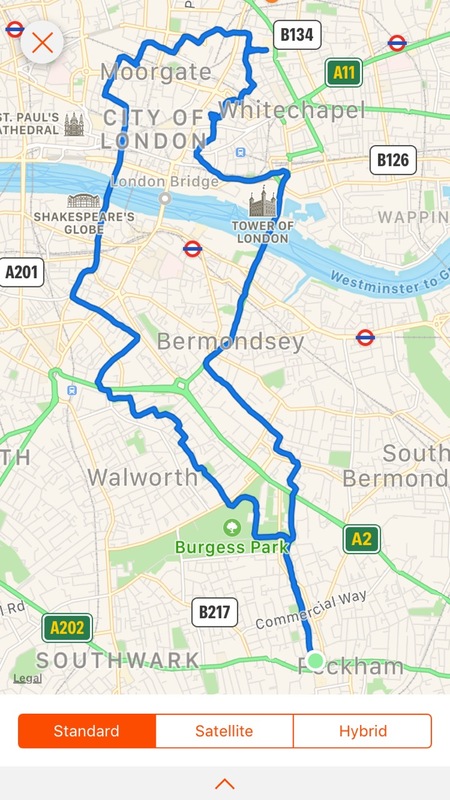 Similar route to last year, outward via Burgess Park, Quietway 1 and Southwark Bridge, then a route past Guildhall and round back of Liverpool St station. At Rapha Cafe in good time. Some riders had a look at the market, most consumed the excellent coffee and chatted. Back through the lanes south of Spitalsfied, then turn left into Eastcheap. On the way met the fine horse and cart in Cullum St. This is Perceval, one of Statues in the City. So a preview for the sculpture tour on Boxing Day (see report above). 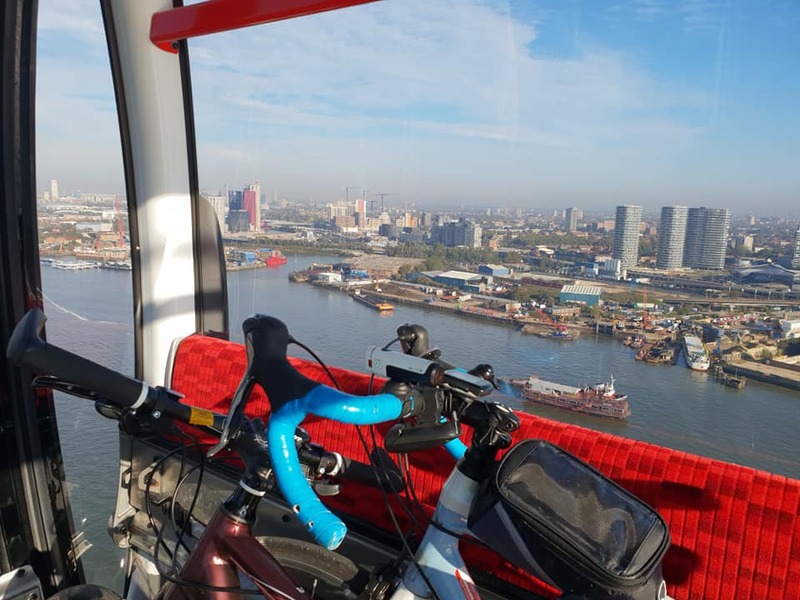 On past the Walkie-Talkie and directly over Tower Bridge, then picking up Q1 from Tower Bridge Rd, along Willow Walk, and finally back to Glengall Road and the Canal Path. Into Peckham Square approximately on time and not too cold at all. Route map below. London Bridge to Notting Hill. Dec 15th, 2018. 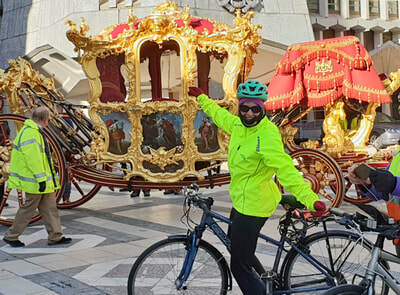 On the third Saturday in December it's now traditional to lead a +-ride into the West End and give riders an opportunity to buy posh presents. Ten of us started in cold but dry conditions from London Bridge and managed to pass Borough Market before the shoppers were out in large numbers. 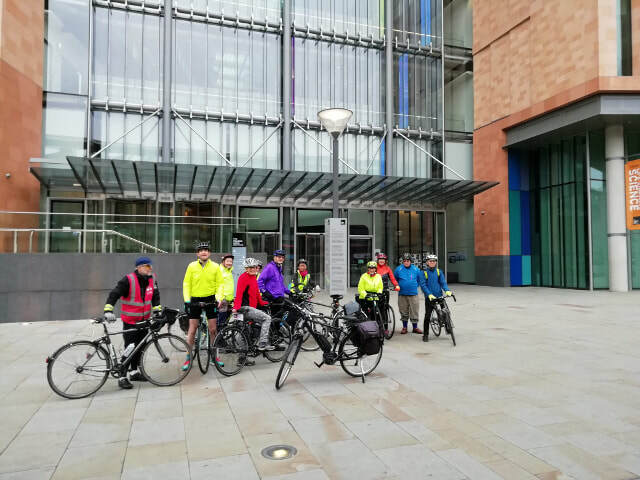 Q14 and CS3 took us to Blackfriars where we skipped the tempting loop around Middle Temple, instead we went straight up Fetter Lane and via Lincoln's Inn Fields to the fringes of Covent Garden. It isn't often that we have a chance to appreciate cycling infrastructure in Westminster but the contraflows up West and Litchfield Streets are useful. They would be even better if the lights at Charing Cross Rd had been programmed to let cyclists through without having to push the button at the pedestrian crossing. Immediately left after Cambridge Circus and into Soho where it was still very early in the morning on local time, which meant the roads were quieter than later in the day. A glimpse of M&S from the seasonally named Noel St without having to feel the pain of Oxford St before we admired the first major illuminations on the ride in Regent Street. Bond Street followed soon afterwards but was rated lower and not worth a stop for shopping. Nothing in the Mayfair windows appealed so we crossed Park Lane and East Carriage Drive to meet pedestrians heading for the Winter Wonderland in Hyde Park. On the far side of Bayswater Road waited areas unexplored by healthy rides and their discovery has been made easier by the extension of CS3 north of Hyde Park. Whereas the first cycle superhighways were only blue paint this has been blended more discreetly into the environment. A dash of paint across Bayswater Rd to guide cyclists into the lane on the right of motor traffic might have been helpful. too late or too early for one of London's finest shopping emporiums, Whiteleys closed a few weeks ago for redevelopment. Still following Q2 we crossed the postcode boundary into W11, admired the once again fashionable houses in Notting Hill and passed Portobello Market (and didn't buy anything). Across Holland Park Avenue Avenue along the gentler western side of Holland Park back into familiar territory, never was a bunch of riders so happy to reach the warmth of the Design Museum and its even warmer coffee. mews and lanes we picked up Exhibition Rd (rumoured to have been labelled a quietway) which brought us back into Hyde Park. 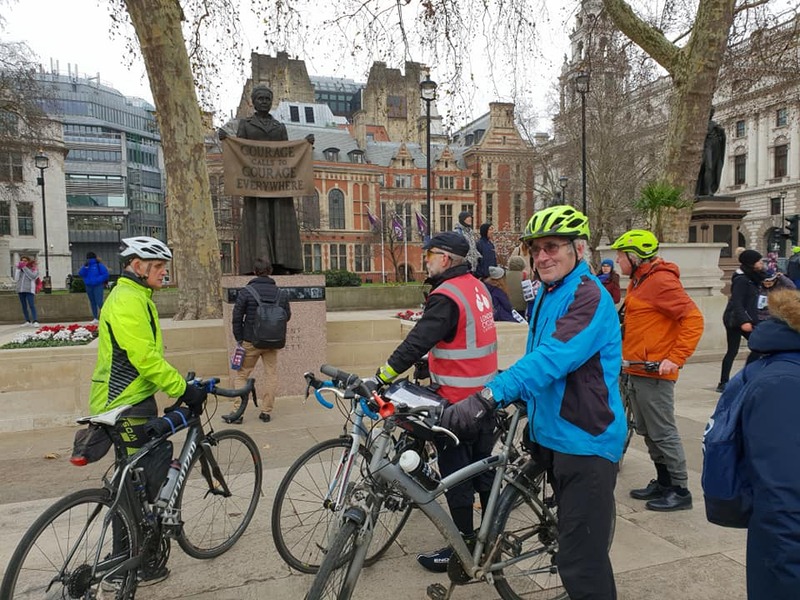 Then CS3 through the main pedestrian stream to Winter Wonderland to Parliament Square were we stopped to remember the 1918 general election, which took place exactly 100 years and 1 day before our ride. It was the first election in the UK after the 1918 Representation of the People Act had been passed, the first election were women had the franchise (although still restricted). 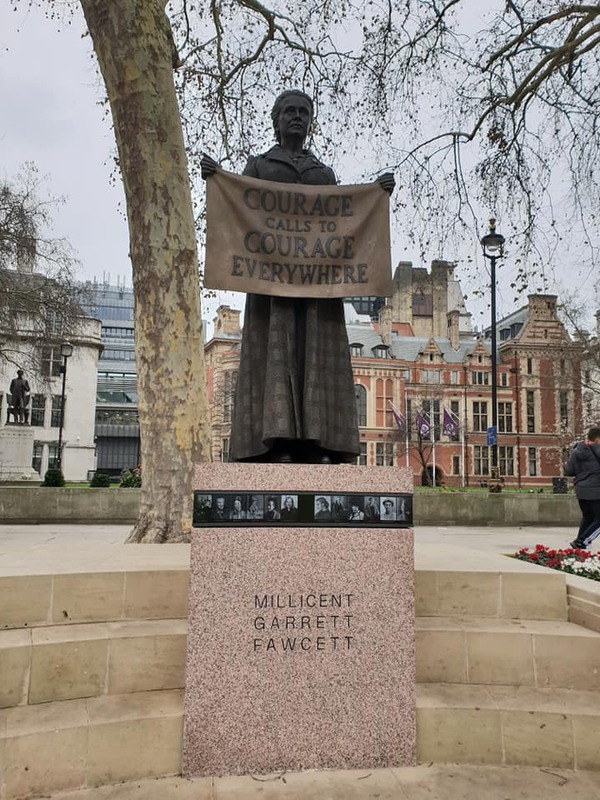 Millicent Fawcett was one of the suffragists and her recently installed statue attracted more attention from visitors than any of her male companions in the square. Dec 8th 2018. Haggerston to Canada Water. About 10 riders at Canada Water on a breezy but dry morning. Took the Overground to Haggeston where another 10 were waiting, so a group of 20 headed to the Regents Canal towpath. Lots of runners, but we made steady progress. Looped into Victoria park where there was a bit more space to share. Then back to the towpath until Mile End Park. Through the park, including the Green Bridge over Mile End Rd. All bridges should be like this! At Limehouse basin headed west along the Thames to St Katherines via the inland route along the "canals". Usual quiz at the frieze at Ivory Dock. then Tower Bridge and the usual NR4 Thames-side route east to Canada Water. Weather was kind and timing was good, so a happy bunch of cyclists finished back where about half of us had started. Some regular riders were missing as it was the Surrey Docks Farm Xmas Fair where they volunteer. Some riders headed that way at the end to see Santa and sample the mulled wine. Route at https://goo.gl/zuUrvb GPX file below. A washout. Heavy rain in the morning coupled with a forecast of this continuing until lunchtime put everyone off. 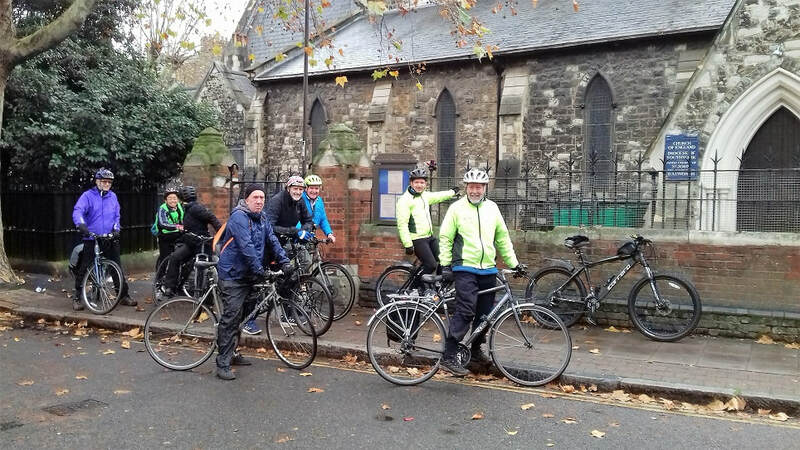 So just the Ride Leader at Dulwich at 10am with the rain stopped - and it stayed stopped all day. So much for weather forecasts. Previous no rides were all for snow. This was the first for rain. I was riding in a lightweight breathable top and waterproof overtrousers. This is enough to keep comfortable in rain when the temperature is reasonable. This is a nice loop of you do not mind a few small(ish) hills. 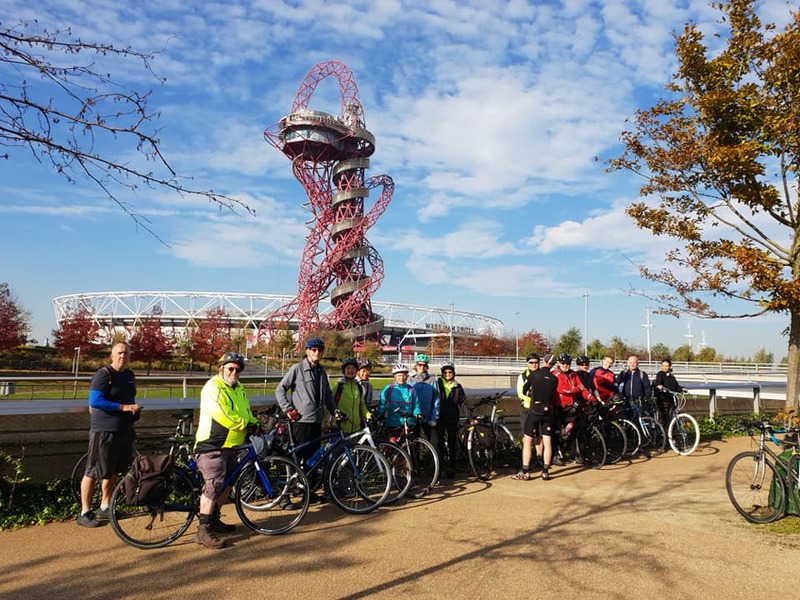 Takes in Peckham Rye Park, dips into Nunhead Cemetery, Telegraph Hill, Waterlink Way (Nat Route 21) from Brookmill Park to Ladywell Fields and Blythe Hill Park. If you want to give it a try on a nicer day, route is at https://goo.gl/GcpuR5goo.gl/GcpuR5 or on GPX file below. 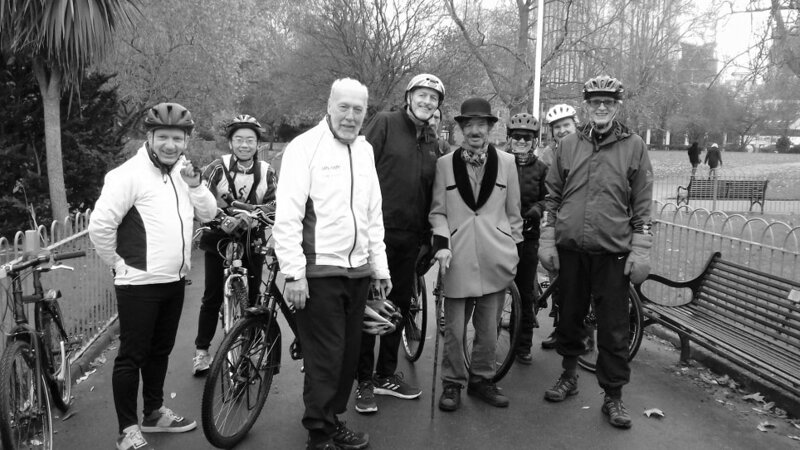 Cool November morning in Peckham Square with 9 riders ready for a ride round locations associated with Charlie Chaplin. Down the Canal Path, across Burgess Park and through to East Street where CC was born (supposedly - not much in the the way of paperwork to back this up...). Then Barlow St, one of the many houses CC lived in during his upbringing in Southwark and Lambeth. Speculation that his family often had trouble paying the rent. Next, still in Walworth close to East St, St Johns Church, where Charlie's parents were married. Heading into Lambeth stopped at the Imperial War Museum. This was originally the Bethlem Hospital. Charlies mother developed mental health problems and spent time in this horpital. Next the Three Stars pub in Kennington where Charlie last saw his father. On to the Cinema Museum, the remaining part of the old Lambeth Workhouse, in Dugard Way just west of the Elephant and Castle. Charlie was here aged 7. Another 2 houses next, one in Kennington Rd and the other in Methley St, then The Queens Head pub run by Charlie's uncle. Final stop was at Glenshaw Mansions on Brixton Road where CC resided from 1908 to 1910 with his half-brother. Return route again through Burgess Park and along the Canal Path. Back in nice time. Many thanks to Harry for leading and doing all the research. Much more information in the pdf file below. Track at www.mapmyride.com/workout/2508868517. If you did not make it, try the ride for yourself. Nov 17th, 2018 Commons, Parks and Windmills. 13 cyclists at the Burgess Park Cafe in excellent November sunshine. 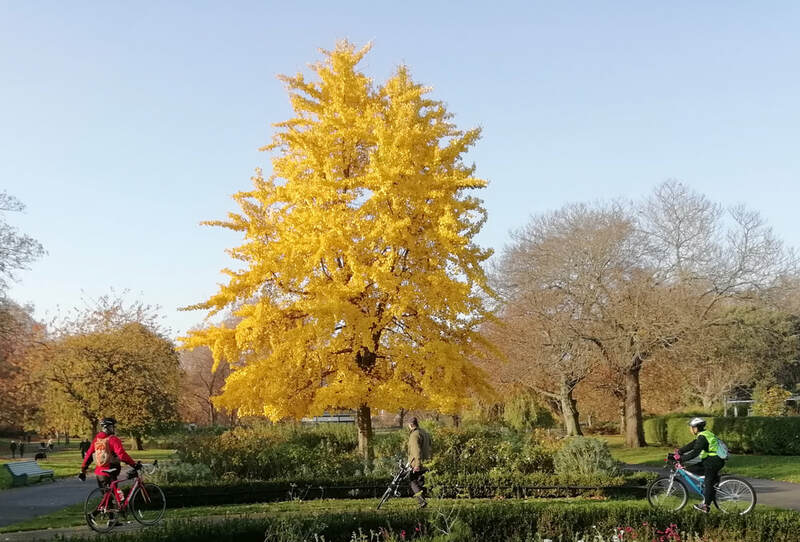 First stop Myatts Field where the bright yellow Ginkgo tree by the entrance to the park caught our eye (see photo). Quiet streets to Brixton Windmill. By chance a member of the Friends was unlocking the Mill and allowed us into the ground floor and did a brief chat about the mill. Built in 1816 and restored in 2003. It is usually open second weekends each month from March to October. You can get inside sooner by visiting Santas Grotto on Sunday 16th December (http://www.brixtonwindmill.org/whats-on?item=181). More info about the mill at http://www.brixtonwindmill.org/home. Next stop Clapham Common via LCN25. Along Windmill Drive, near the Windmill pub - but alas no windmill. In fact no-one knows where this mill was located, but it is mentioned in a lease of 1631. Short (ca 1km) hop along Thurleigh Rd (LCN3) took us Wandsworth Common where we stopped at the Skylark Cafe. This was incredibly crowded - in fact the Common was really busy with lots of kids Saturday morning football in progress. In the 20 min allowed a few cyclists did manage to get a drink, then off across the Common and past the Royal Victoria Patriotic Building. This was built as a school for orphans from the Crimean War and has an interesting history (see https://en.wikipedia.org/wiki/Royal_Victoria_Patriotic_Building). Around the corner on the on the busy B234 is the tower of the Wandsworth Common Windmill. It is also next to the railway cutting, and this is no coincidence. As a Wandsworth Society plaque explains, it was built in 1837 to drain water from the cutting. So actually not a windmill at all but a windpump. It stopped working in 1870 and no-one seems to have tried to restore it. Picked up LCN3 again and headed SE to Tooting Bec Common. Another busy place, particularly the Tennis Centre, but plenty of room on the paths. From the north edge of Tooting Bec Common we turned homeward heading for Brockwell Park via Streathem Hill station and Upper Tulse Hill. Crossing the South Circular at Hillside Rd was tricky. No lights, so used the pedestrian island. Fortunately a coach stopped to let us across the eastbound carriageway when some of us were stuck in the central island. So one cycle-friendly coach driver out there! This route is proposed for a Quietway, and the Open Street Map already indicates a light-controlled crossing, so maybe next time we do this route life will be easier. Round Brockwell Park on the perimeter path to Herne Hill station exit. Then the horrid multi-way junction under the rail bridge to negotiate. Was expecting to need to get everyone dismounted but miraculously a break in the traffic allowed us to turn without stress into Half Moon Lane. Now back on familiar territory and in good time, so stopped off briefly at Herne Hill Velodrome. There are always riders who have never been to this iconic venue. And it is always busy on a Saturday morning. Back to Burgess Park past the Dulwich Hamlets ground on a route including Avondale Rise and Kelly Rd. Still marvellous sunshine and everyone smiling. Route at https://goo.gl/jqMqzR. Our annual sortie on the roads closed in advance of the Lord Mayors Show Parade. Report from Ride Leader Werner. 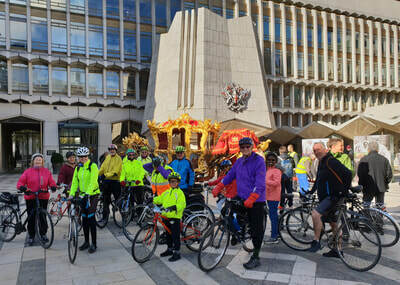 annual ride to welcome the City's 691st Lord Mayor. apart from the faint sound of music coming out of Temple Church. got out of the underpass. impress Strava). Back at Canada Water at 11:59." 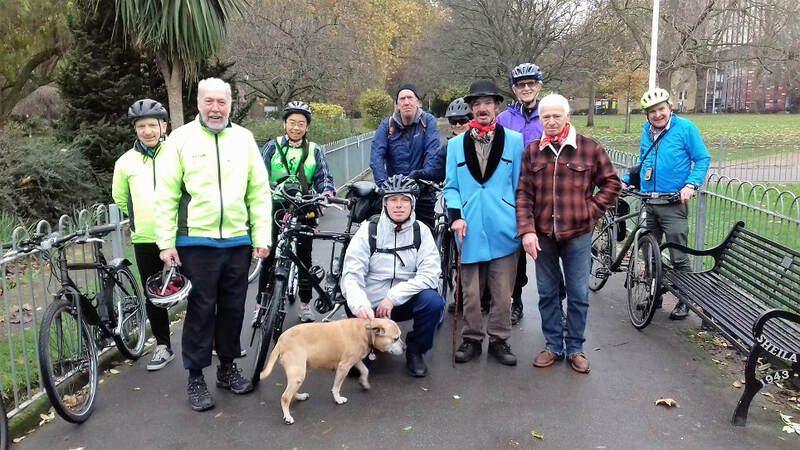 18 riders set off from Dulwich Clock Cafe in Dulwich Park on a bright, sharp, November morning. Route took us first to our Peckham start point in Peckham Square via Court Lane Gate, Crystal Palace Road and Rye Lane. Next Canal Path and Glengall Rd through to Quietway 1 at Oxley Close. Short stretch of Q1, then to Potters Field Park by Tower Bridge via Bermondsey Spa Gardens and Shad Thames. At Tower Bridge in good time so took photos. Problems with GPS led to a return on the same route, not the planned alternative via Burgess Park and the Greenway (which is on the route map linked below). Riders back at Dulwich Clock Cafe sharp at 12 o'clock. Many thanks to Charlie who, at short notice, led the ride (and fixed some gears) and to David for taking the rear. Planned route at https://goo.gl/Kz7wjr or .gpx below. 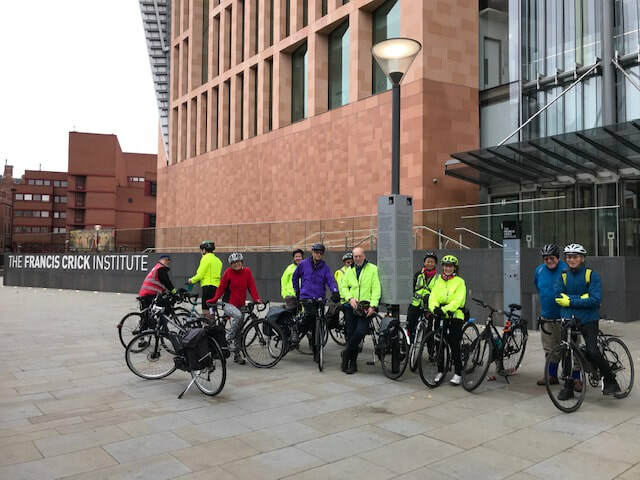 21 of us set off from Peckham Library on the first cold Healthy Ride of the season. A bit of a challenge for our youngest participant - little one in a bike carrier - so she and Dad dropped out at Southwark Bridge to warm up. We went out via Burgess Park and through back roads up to connect with Q1 at Trinity Square then up CS7 - loads of cars parked in the lane as usual on a Saturday, it really needs to be upgraded to be properly segregated to qualify as a Superhighway! Over Southwark Bridge then through the City past Guildhall and the Barbican to Look Mum No Hands. Everyone very happy to have a cafe stop on such a cold day! Several people left at the cafe and the rest of us headed back. At the Guildhall I spotted the Lord Mayor's State coach so we rode in for a photo opportunity. Then back to Southwark Bridge to collect the warmed up toddler and Dad and back to Peckham, a bit behind our scheduled finish. Return was definitely warmer than our outward journey! Total distance 9 miles, route at goo.gl/OpBXma or .gpx file below. 16 of us set out on a lovely sunny day from the Cutty Sark heading to the Emirates Airway at the O2 via the Thames Pathway. 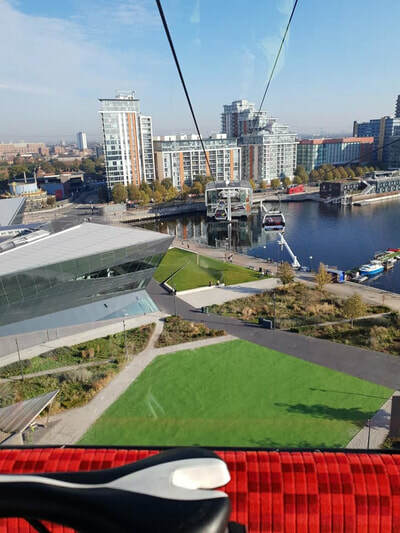 We boarded our capsules making the most of the opportunity to take some pictures of the stunning views over London. Next headed off for the Memorial Recreation ground to use the new ramp onto the Greenway. This has improved our route greatly removing a road section past West Ham station we used previously. 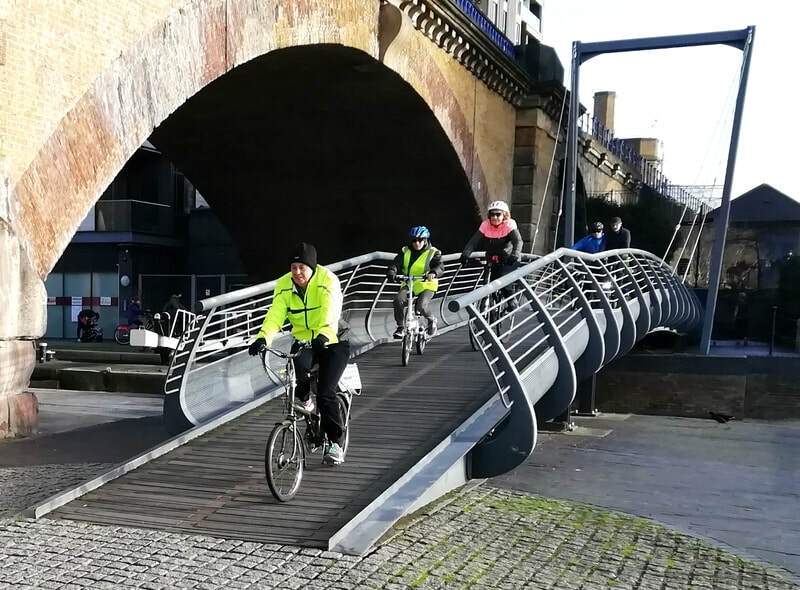 The new ramp is wide and very cycle friendly. 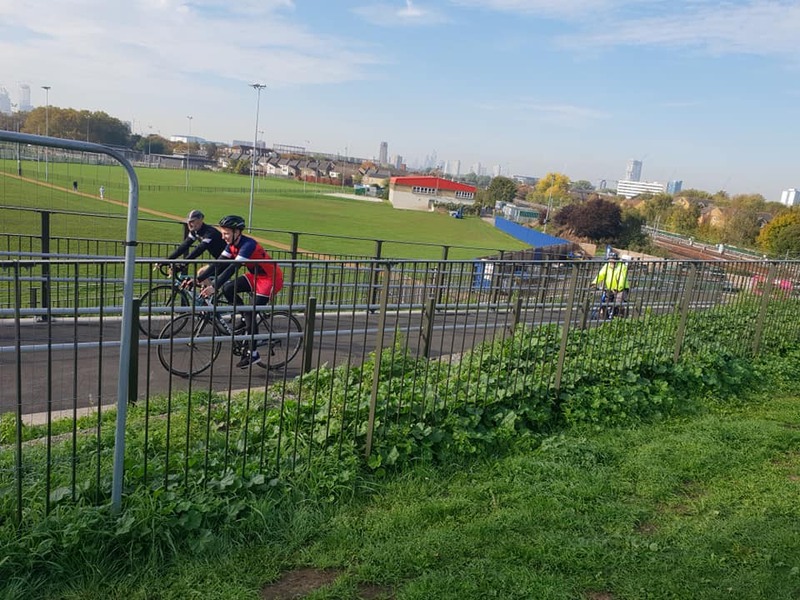 Also good to note that we no longer have to use the very narrow gates limiting access to the Memorial Recreation ground as a path has been opened up alongside them allowing easy access. We paused for a group photo after entering the Olympic Park before heading off to the Timberland Lodge for coffee and snacks. The park was very quiet, despite the lovely weather - unlike on our last visit - allowing us to enjoy a spin around the park going past the Velodrome, canal side cafes and the Copper Box before exiting via the View Tube. For our return journey we rode back along the canal taking the route past Three Mills, Cody Dock and then through the Millwall Docks exiting at Mudchute and across the park to our end point at the Greenwich Foot Tunnel. Riders at Salter statues in Rotherhithe. Thanks to Sarah for this photo. 18 set off from Deal Porter Square in breezy weather but very mild for time of year. 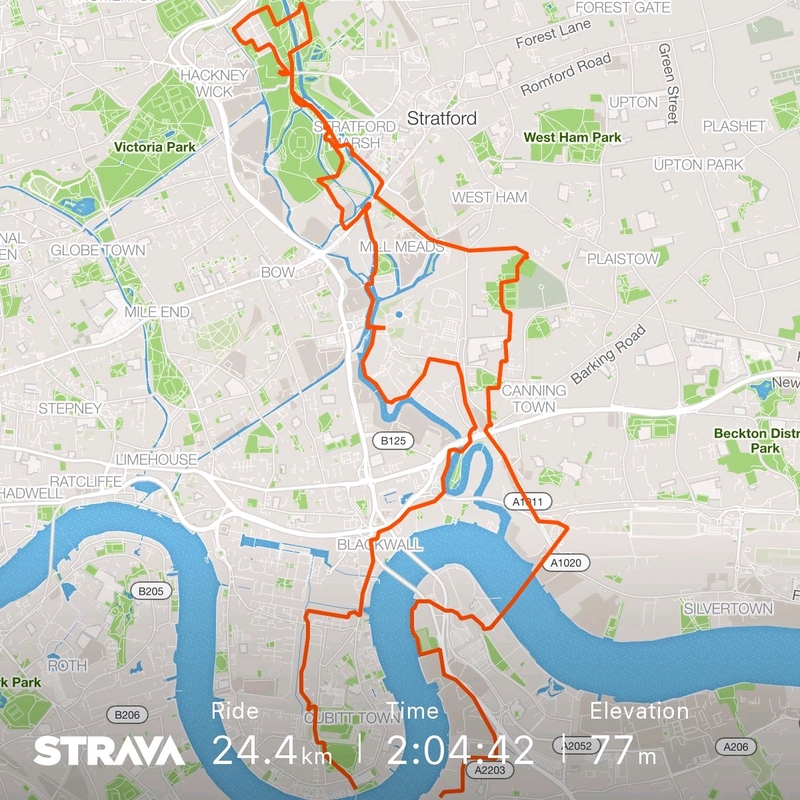 Uneventful ride on this nice route following the Thames first to Greewich, then through the tunnel and upstream round the Isle of Dogs and through Wapping. Then across Tower Bridge and downstream back to Canada Water via National Route 4. David leading, Amanda very helpful as backmarker. Arrived back 5 minutes early. Route at https://goo.gl/DhhUOD, .GPX file below. Amanda leading. Here is her report. It was a chilly morning, with rain soon to arrive. However 9 of us at the start at Dulwich Clock Cafe, joined by 3 others a little bit further on. Out for a 10 mile circular trip to and around Crystal Palace Park. We set off behind the flats and a little way up Lordship Lane, turned left into Underhill Road from there all quiet roads and National cycle Route. Along Wood Vale, crossed over and into Benchley Gardens, that David informed us was a former Nunhead to Crystal Palace railway line. We then turned right into and through Camberwell New Cemetery, now joining LCN22 through to Crofton Park. We picked up NCR21 in Ladywell Fields. There we had a surprise as for a short stretch beside Catford Bridge Station, the River Ravensbourne had appeared, nicely landscaped (see photo below). Really improves what had been a rather grim stretch. All part of the work by Barratts for their huge Catford Green housing development. Continued cycling along NCR21 Waterlink Way beside the Rivers Ravensbourne and Pool to Penge. Made a short loop in and out of Cator Park (reviewing the Sustrans 10,000 miles of National Cycle Route commemorative post). Then rode along Lennard Road picking up LCN27 around Penge East Station and across into Crystal Palace Park. A brief stop at the dinosaurs as it now started to rain quite heavily as we made our way through the open ground middle sections of the park. 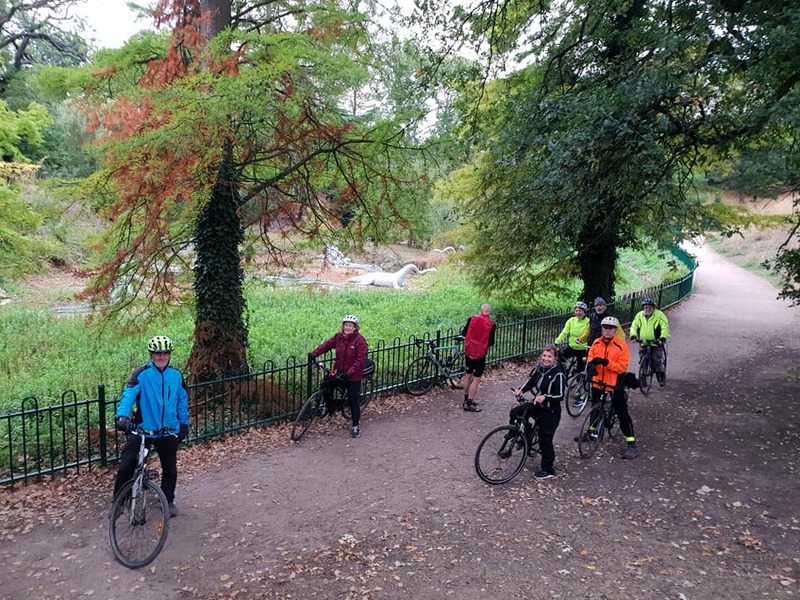 The group had been advised of three sharp inclines in the park that would take us out to the top 100 yards of Crystal Palace Park Road. The inclines were spread out evenly but, as they are short and sharp many had the opportunity and preference to walk up them. 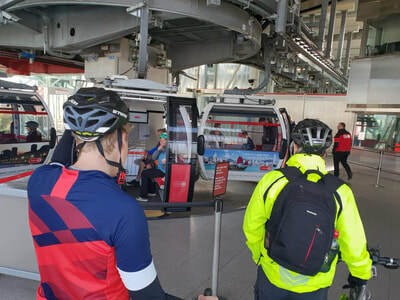 We would have dipped onto the top concourse had it not been raining, just for the view and to see the height we had achieved by our circular meander from Dulwich, but by now all were just looking forward to the 15 minute last section of downhill back to base. We crossed the top A212 easily via the new cycle crossings, making our way through the rain down Fountain Drive and College Road and arrived back safely, a bit earlier than usual due to the rain. Thanks to David for back marking. Route at https://goo.gl/rfUzwn, gpx file below.